Experience 4Runner's refined side. With this all new Nightshade package, your 4Runner will look different than any other before, with Black Outside Mirrors, Black chrome grille and fog lamp cover, Running Boards, Black Accents on Front and Rear Bumpers, Black Door Handles, Black Lower Rocker Panel, Delete Splash Guards, Leather Wrapped Shift Knob, Metallic Dash Accents and 20 inch Black Alloy Wheels! The Nightshade package gives additional features to this 4Runner that is already configured as a 7-Passenger Limited. It is off-road ready but also delivers a thoughtful complement of premium comfort and convenience features including heated and ventilated front seats, a 15-speaker JBL® Audio System, and clearance and backup sensors. 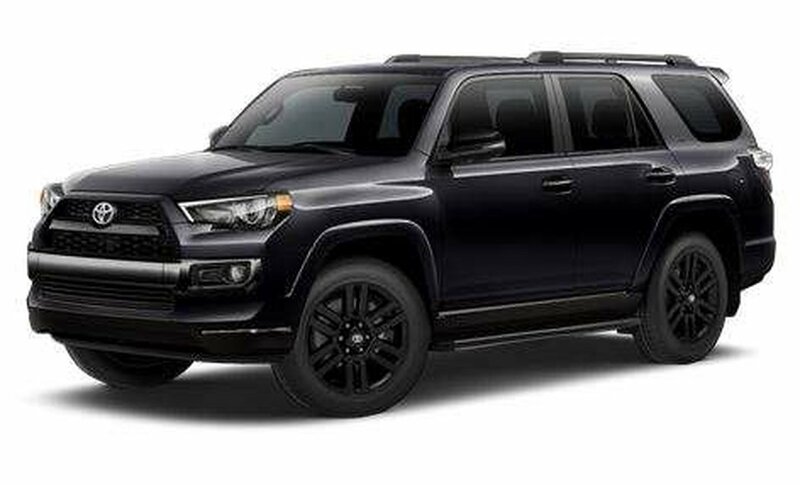 Standard features include 4.0 L V6 Engine and One-Touch 4WD, 6.1 inch Touchscreen Audio with Navigation & Backup Camera, Running Boards & Roof Rails, Towing Hitch and Trailer Sway Control, Toyota's Star Safety System. This Limited package gives you 15 Speakers, JBL Audio, Subwoofer, AVN Premium Navigation, Dual Zone Automatic Climate Control, Push Button Start, Smart Key System, Front & Rear Clearance Sonar, 4WD Full-Time, Automatic Headlamp System, Rear Door Courtesy Lamp, Puddle Lamps, Leather Seat Surfaces, Heated & Ventilated Front Seats, 3rd Row Seats, Driver Seat Memory System, X-REAS Sport Suspension, Full Size Spare Tire with Alloy Wheel and More!